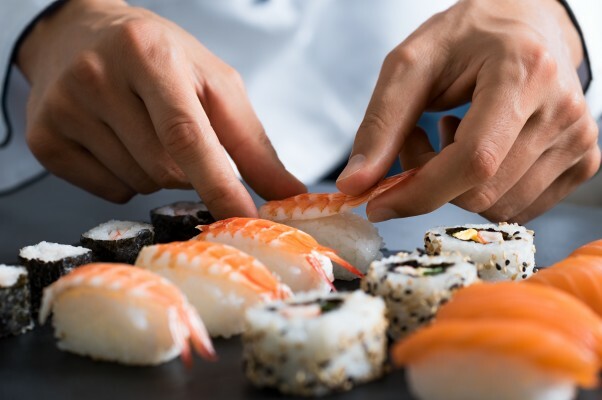 Japanese delicacy sushi threatens to topple some sandwiches from their place as the nation’s favourite lunchtime snack thanks to the promotion of celebrity chefs such as Jamie Oliver. UK sales have increased by more than 21%, across all retailers, according to figures from market analyst AC Nielsen. Top sellers are nigiri, fish on a bed of rice, prawn rolls; smoked salmon, cucumber and red pepper rolls. If you are considering introducing sushi or sashimi to your range, you should be aware of the legislative requirements for fish to be consumed raw (for instance in sushi or sashimi) or almost raw (for example in gravad lax). These exist to prevent consumers ingesting live parasites found in fish. This is particularly relevant for pregnant women and the elderly, where ingestion of live parasites could pose a considerable health risk. Fishery products to be placed on the UK market for human consumption must meet the requirements of Regulation (EC) No. 853/2004 ‘laying down specific hygiene rules for food of animal origin’. In relation to parasites, Annex III, Section VIII, Chapter III, Part D and Chapter V, Part D specifically relate to handling of fish that may be contaminated with parasites and which may be eaten raw or almost raw. • Fish or fishery products must be visibly inspected to detect and remove parasites. • Those products which are obviously infected must not be placed on the market, even if the visible parasites have been removed. • All fish and fishery products to be eaten raw or almost raw must undergo freezing to ensure that any non-visible parasites or undetectable larvae of nematodes are destroyed and the products become fit for human consumption. This treatment should also be applied to the species/types of fish, specified in Chapter III, D, 1 (b) (i.e. herring, mackerel, sprat and wild salmon), which are to be cold-smoked at an internal temperature of 60oC or less. In addition, all fish or fishery products that are marinated and/or salted by a process not sufficient to kill parasites and their larvae will have to be frozen. • The freezing process must ensure that the product be subjected to a temperature of not more than –20oC for not less than 24 hours. This treatment must reach all parts of the product. • The freezing requirements do not apply to cold-smoked farmed salmon, which for the purpose of interpreting the legislation is not considered a raw or almost raw product.